Stoughton @ Attleboro – Postponed to Tuesday, 4/9 at 3:45. Canton @ Franklin – Postponed to Thursday, 4/11 at 3:45. Foxboro @ Taunton – Postponed to Tuesday, 4/9 at 3:45. Milford @ King Philip – Postponed to Tuesday, 5/28 at 3:45. Sharon @ Mansfield – Postponed to Thursday, 4/11 at 3:45. North Attleboro @ Oliver Ames – Postponed to a Tuesday, 4/9 at 3:45. Taunton @ Foxboro – Postponed to Friday, 4/12 at 4:00. Mansfield @ Sharon – Postponed to Friday, 4/12 at 3:45. Oliver Ames @ North Attleboro – Postponed to Monday, 4/22 at 3:45. King Philip @ Milford – Postponed to Tuesday, 5/28 at 3:45. North Attleboro, 7 @ Canton, 8 – Final – Canton’s Tommy Vaughan scored the game-winning goal with just a couple minutes left in the game, breaking a 7-7 game to give the Bulldogs the win. North Attleboro led 3-1 after a quarter and 4-1 at halftime but Canton exploded to six goals in the third to seize a 7-4 lead. The Rocketeers scored three times for knot the game before Vaughan tallied his fourth goal for the winner. Griffin Roach, David Allen, Brendan Clifford, and Dan Cohen each scored once for the Bulldogs. 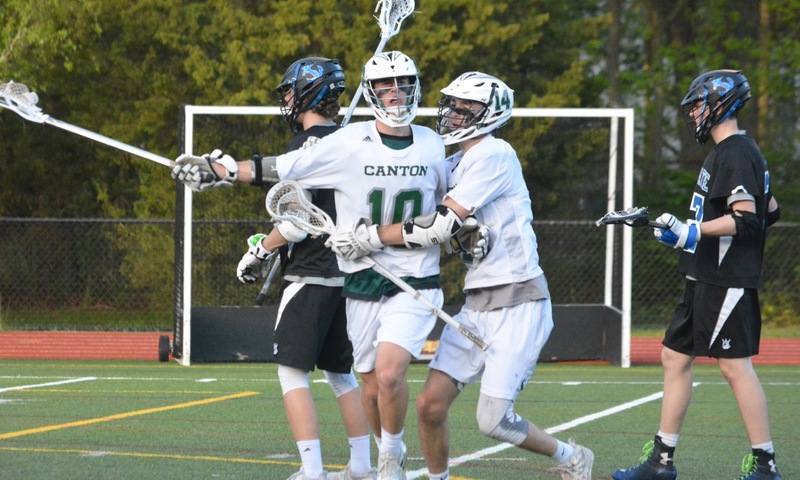 CHS coach Bill Bendell said sophomore Jeff Fitzpatrick dominance at the faceoff X and Brendan Albert’s fantastic effort on defense were huge factors in the win. Ryan Rajotte paced North Attleboro with two goals and two assists while Nick Ward added two goals. Jake McNeany made 16 saves in goal for the Rocketeers. Attleboro, 5 @ Oliver Ames, 19 – Final – Click here for a photo gallery from this game. – Oliver Ames built an 8-3 lead at by halftime and never looked back in a win over visiting Attleboro. Hunter Costello had a team-high five goals while Shane Kilkelly, Sandro Mascierelli, Sam Stevens and Colin Bourne each scored three times. Remi Creighton (four points) won eight of 10 faceoffs for the Tigers. Attleboro’s Zach Thomas scored twice while Michael Strachan, Matt Perry, and Keigan Conley each scored once for Attleboro. Sharon, 4 @ Foxboro, 9 – Final – Foxboro held just a one-goal advantage at halftime (4-3) but outscored the Eagles 4-0 in the third to pull away for the win. Shayne Kerrigan scored scored twice in the third while Brendan Tully (two goals) and Pete Conley each scored once to put the Warriors ahead 8-3 entering the fourth. Charlie Baughan finished with three goals for Foxboro. Stoughton, 3 @ King Philip, 17 – Final – King Philip improved to 3-0 on the season with a win over Hockomock League foe Stoughton. Colin DeVellis paced the offense with four goals and four assists while Andrew Sajdak added three goals and two helpers for the Warriors. Sam Mattson added a hat trick and Matt Minkwitz finished with two goals. Oliver Ames, 14 @ Attleboro, 7 – Final – Five different players found the back of the net to help Oliver Ames earn a win on the road at Attleboro. Maddie Kullen also had a strong performance in net for the Tigers. Kyra Lyons and Sydney DiLiddo scored three goals apiece for Attleboro while Rylee Fontes added one goal. Foxboro @ Sharon – Postponed to Monday, 4/22 at 6:15. Franklin, 16 @ Milford, 1 – Final – Kelsey MacCallum scored three goals and had one assist while Sara Carney found the back of the net twice to pace the Panthers to a win on the road. Attleboro @ Stoughton – Postponed to Tuesday, 4/9 at 3:45 at Attleboro. Franklin @ Canton – Postponed to Thursday, 4/11 at 3:45. Taunton @ Foxboro – Postponed to Tuesday, 4/9 at 3:45. Mansfield @ Sharon – Postponed to Thursday, 4/11 at 3:45. King Philip @ Milford – Postponed to Tuesday, 4/9 at 3:45. Stoughton @ Attleboro – Postponed to Monday, 4/9 at 3:45. North Attleboro @ Oliver Ames – Postponed to Friday, 4/26 at 3:45. Sharon @ Mansfield – Postponed to Tuesday, 4/9 at 3:45. Milford @ King Philip – Postponed to Tuesday, 4/9 at 3:45. WALPOLE, Mass. — North Attleboro gave a perennial state power in Walpole all it could handle, but the Rebels put together a late run to end the game, earning a 7-4 win. North’s staunch defense put together one of its most impressive performances of the year, forcing Walpole into an uncharacteristically low scoring affair. Time after time Big Red forced shots that went way off the cage, and goaltender Jake McNeany (10 saves) was everywhere for the state’s fifth-best scoring defense. Senior captain Jason McNeany (three goals) saved one of his best performances for last, winning 11 out of 15 faceoffs to give North the chances it needed, as well as being the game’s leading scorer. Fans of a defensive battle were in for a treat as 10 minutes passed before a shot on net took place when Walpole’s Thomas Shea opened up the scoring for the Rebels. There would be only one more shot on cage, as well as nine combined turnovers throughout the first, leaving the score at 1-0. The second quarter saw both offenses settle down, but had a similar result. Cullen McGlynn had the lone tally making it 2-0 for the Rebels halfway through the quarter. North had chances to respond, as Walpole picked up a penalty with 1:35 remaining in the half, but hit the post twice. 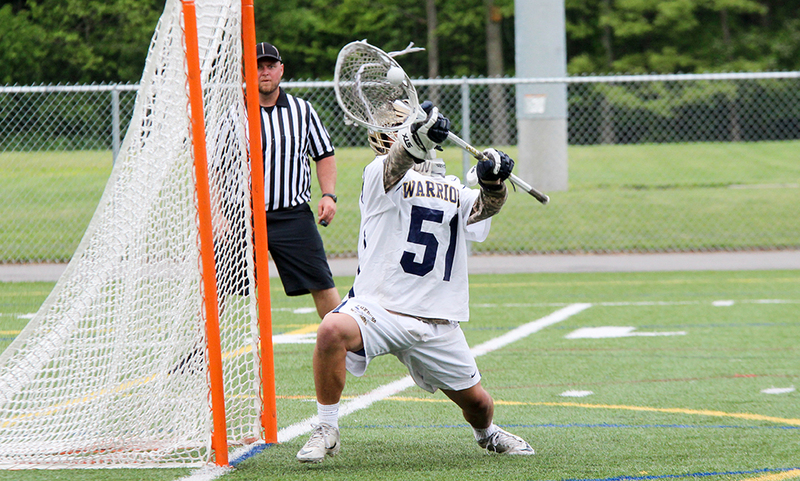 Walpole goalie Joseph McGrath made four saves in the quarter and kept the score at 2-0 going into the half. Importantly for Big Red though, Walpole was hit with another penalty with just three seconds left on the clock. Carrying a man advantage into the second half, Jason McNeany won the faceoff, hit teammate Tommy Lindstrom (two assists), who gave it right back to McNeany, who buried the man-up ripper from straight on to give North their first goal of the game. Both offenses went back and forth as Walpole’s Kyle Hirshom responded to make it a two-goal game again, quickly followed up by Andy DeMattio’s goal off a nifty feed from Nick Ward. Two minutes later Lindstrom was able to draw a penalty and find McNeany again, who scored on the continuation and tied the game, 3-3. Unphased by the momentum, UMass Lowell commit Conor Foley was able to put one in the back of the net 30 seconds later to silence the North crowd. Walpole got just the break they needed to steal all the momentum one minute into the fourth quarter. After a Jake McNeany save, a scrum formed in front of the net. After 10 seconds of fighting for it, Foley was able to poke it loose and hockey slap shot it into the back of the net, making it 5-3 in favor of Walpole. Ryan Birch scored the Rebels’ sixth of the game to extend the lead to three with eight minutes to play. McNeany willed his way through a Walpole defender to make it a two-goal game again but two back-to-back North penalties and excellent goaltending by McGrath would make that the last opportunity for a comeback. After North’s defense killed off a six on four penalty kill, McGlynn was able to add an insurance goal to make it 7-4, which would stand for the remainder of the game. Although not the way the Rocketeers (15-5) wanted to end their season, they have plenty to hang their hats on, as they exceeded all expectations for this year. Replacing their entire starting offense from last year other than Lindstrom, as well as 2017 Hockomock League MVP goaltender Dan MacDonald, is no small task. Big Red proved that they’re at a point where they don’t have to rebuild, they reload. Still a relatively young program, North has come a long way in 11 years. A program that had just eight wins in its first four years when head coach Kevin Young took over has now strung together 31 wins in the last two years, and everything is trending up for Big Red, as a boatload of talented underclassmen with lots of experience return to next year’s roster. NORTH ATTLEBORO, Mass — The North Attleboro boys lacrosse team won its first playoff game since 2014 on Wednesday, and did so in impressive fashion from start to finish. Dominating the faceoff, causing 28 turnovers, completing 14 of 16 clear attempts, and drawing eight and a half minutes of penalties, the Rocketeers had complete control the entire game. Big Red’s sophomores shined, as attackmen Andy DeMattio and Jack Connolly tallied four goals and one assist each. Goalie Jake McNeany recorded 12 saves, and Big Red’s defense held Belmont to three goals and dominated in transition. A unique challenge was presented to faceoff man Jason McNeany (one goal, two assists), as Belmont prefers to have defensemen take the faceoff to try and cause an immediate turnover after a loss. The senior captain not only accepted but dominated this task, winning 11 out of 14 draws he took against three different opponents. Thomas Lindstrom (one goal, three assists) opened up scoring a little more than two minutes into the game beating his man one on one and sneaking it past goalkeeper Michael Delhome. Connolly found DeMattio two minutes later to give North a 2-0 lead. Both teams went back and forth exchanging blows as four goals were scored over the next minute. Belmont’s Alec Morin cut the lead to one, only for McNeany to hit DeMattio off the ensuing faceoff to extend the lead back to two. Belmont’s Jackson Pullman to answer to make it 3-2 North but less than 30 seconds later Nick Ward (two goals, one assist) found Connolly and the Rocketeer lead was back up to two. With a minute remaining in the first North would score three goals that changed the entire complexion of the game. Lindstrom found McNeany for a man-up rip then Ward added two strikes the next 14 seconds, the latter being a buzzer beater off McNeany’s faceoff win, and Big Red ended the first quarter up 7-2. The second quarter saw little offense and the beginning of what became a very chippy contest. Belmont’s Pullman scored his second of the game halfway through the quarter but that would be the only goal on either side, as well as the Marauders’ last of the game, leading to a 7-3 halftime. On the flip side North’s defense, currently averaging a seventh best in state 4.6 goals allowed per game, came alive and killed two penalties while causing 10 turnovers in the quarter. To start the second half DeMattio scored his third of the game on a helper from Lindstrom and Jake McNeany made two huge saves from point-blank range to give North all the momentum it needed to squander any chance at a comeback. Over a 90 second span Connolly scored three times, assisted by Labonte, DeMattio, and Lindstrom respectively, to put the game out of reach and head into the final quarter of play up 11-3. Big Red was able to stall out almost the entire fourth quarter until Labonte picked up his second fast-break assist, this time to DeMattio, to make it 12-3 with a minute to play. #6 North Attleboro (15-4) moves on to play at #3 Walpole (14-4) in the D2 Central/East quarterfinal round on Saturday at 3:00.